This pendant comes with a thick silver chain so you know it’ll last. 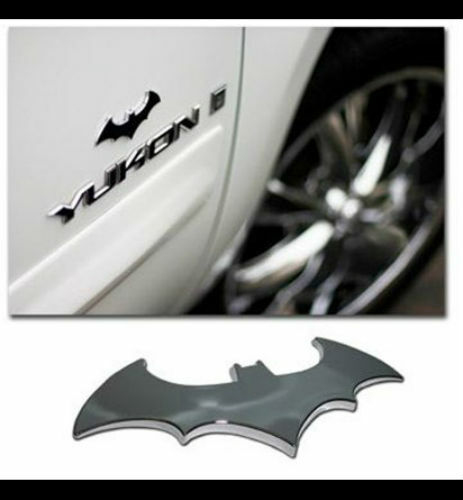 The stainless steel logo has a shiny finish that will let the world know that you’re a Batman fan, wherever you go. Okay, so you don’t own a Batmobile, but the next best thing are these car seat covers. Comfy for long drives, Batman’s classic yellow and black logo is prominently displayed. Show your Batman fandom even at the office with this sleek tie. Made of silk, the blue tie looks professional, and your boss might not even notice the subtle Batman cowls patterned throughout. This even comes pre-tied. Get warm this winter with this fantastic hoodie. It’s cool, it’s comfy and it’s the perfect fit for any Bat-fan. What’s better? It’s hooded with bat ears! Superb for knights out in Arkham city! If you enjoyed the movie, this awesome statue of the two heroes at war ought to tide you over. The characters are designed after Frank Miller’s representations in The Dark Knight Returns. If this item doesn’t lure you in, maybe one of these Superman gifts will impress you. Holy Batman! It doesn’t get cooler than this awesome keychain! Made out of zinc alloy, you can proudly take your love for the caped crusader everywhere you go by hanging this on your set of keys! Comes in various colors and styles, too! Who doesn’t love Batman: The Animated Series? Highly regarded as the best of the best, this bust from Diamond Select Toys is an exact replica of the Dark Knight from the cartoon. Made of a tough resin, it measures 6 inches tall. If no one has seen you and Batman in the same room, could that mean you are the one and only Dark Knight himself? You can be with this apron, which is made of a durable polyester and features the caped crusader’s old gray and blue suit. Spend some time on the dark side of Gotham with this four-pack of shot glasses. Each colored glass showcases a different infamous villain, including Harley Quinn, the Riddler, Catwoman, and the Joker. Make sure to wash these by hand. Convention season is almost here, and soon it will be time to bring out this bad boy. Rubie’s made this black satin cape. It’s 90 inches wide and 45 inches long, which means that it should fit no matter your height. It ties around the neck and features a Batman logo in darker black in the center. 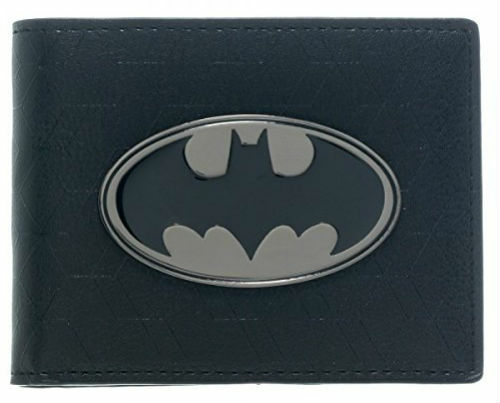 Let Batman keep your cash and credit cards safe with this badge bifold wallet. Made from PU and Polyester, this wallet is 100% officially licensed DC Comics Merchandise. Hide cookies in the coolest way possible with this cookie jar. 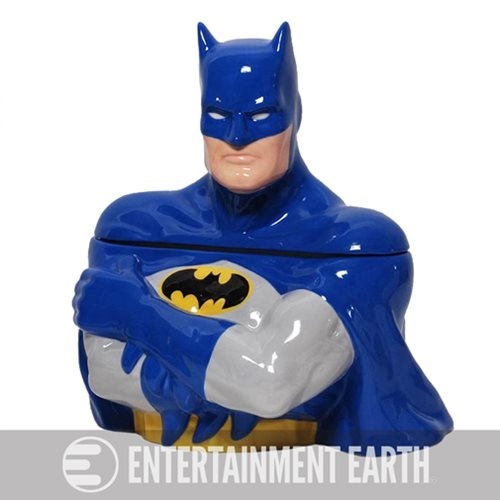 Made of ceramic, Batman is going old school in his gray and blue costume. Between his crossed arms and imposing look, no one will steal your sweets again. This cookie jar is nearly 12 inches tall. What a wonderful way to show off your love for the Dark Knight! 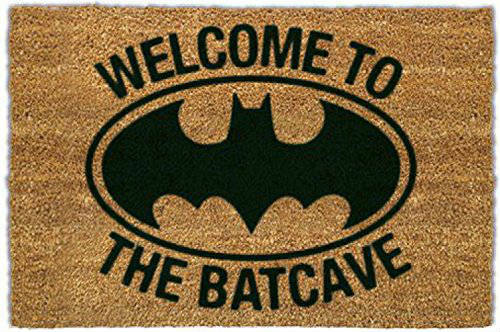 Know somebody who’d happily live in a bat cave? Gift them with this fantastic doormat to place outside their home. The battle between the Joker and Batman is the stuff of legends. Commemorate their feud with this two-pack of painted figures. At 4 inches tall each, these figures are small enough that you can find the space to squeeze them on any shelf that’s filled with your Batman memorabilia. 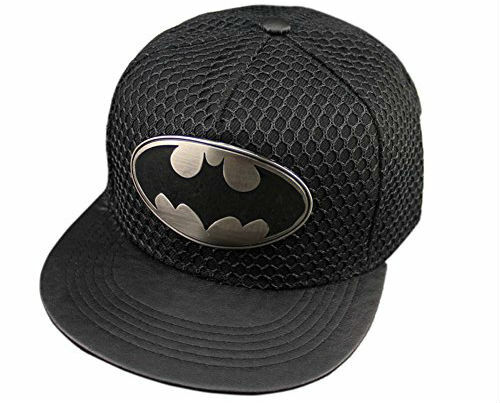 If you know someone who’s a serious Bat-fan and also loves to wear snapbacks, treat them to this awesome cap! Made of a mesh-type material with a plastic silver and black Batman logo shining on the front, you really can’t go wrong with this gift idea! Start your day off right with coffee from your Batman mug. Warm yourself up with black coffee (because we’re sure that’s how Bruce Wayne likes it) or any other beverage in this awesome mug. The old school costume pictured makes this a great addition for any collection. For the female Batman fan, these stud earrings are perfect for every day wear. 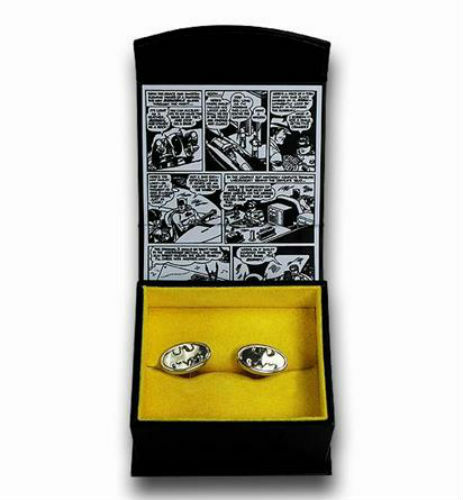 With silver and black gems encrusted into a silver Batman logo, these come with steel posts. Supporting the Dark Knight has never been so fashionable. Freak out everyone but die-hard fans with this creepy Joker travel mug. Although it’s made of durable stainless steel, it’s best that this skips the dishwasher so it looks spooky for years to come. The Dark Knight Rises, the last film in Christopher Nolan’s trilogy, was a smash hit. 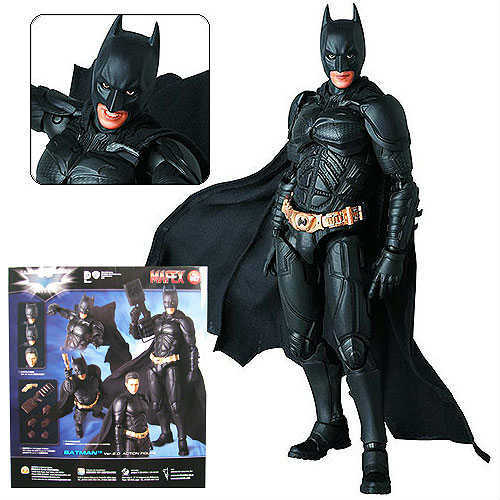 If Christian Bale was your favorite actor to play Batman, now you can have a figure from the flick. Medicom Toy Company in Japan designed this highly-poseable figure, which includes various faces and hands. 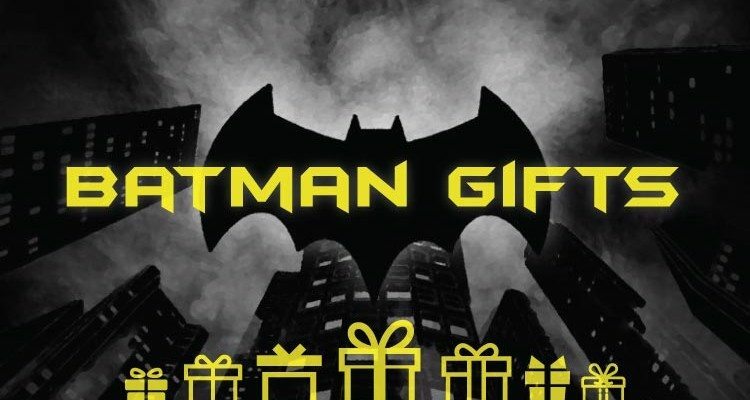 This gift is a perfect Batman item for adults! The black lighter engraved with his outfit is great for everyday use and is guaranteed to impress everyone who sees it!